2) Hijo del Signo, Nitro, Yago b Akuma, Camorra, Espanto Jr.
Gori Driver on Panther for the win. 15:56. 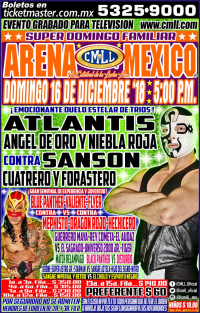 Atlantis replaced Volador Jr. (moved up) on Tuesday. Straight falls, the second by DQ when Bestia ran in for the DQ. 12:47. 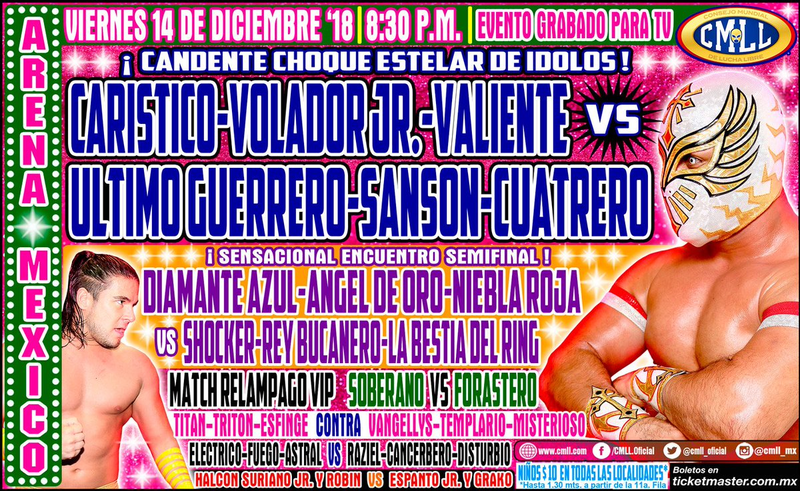 Volador replaced Caristico (injury) on Tuesday and took falls 1/3 to win. Robin & Bengala replaced Magnus & Starman. 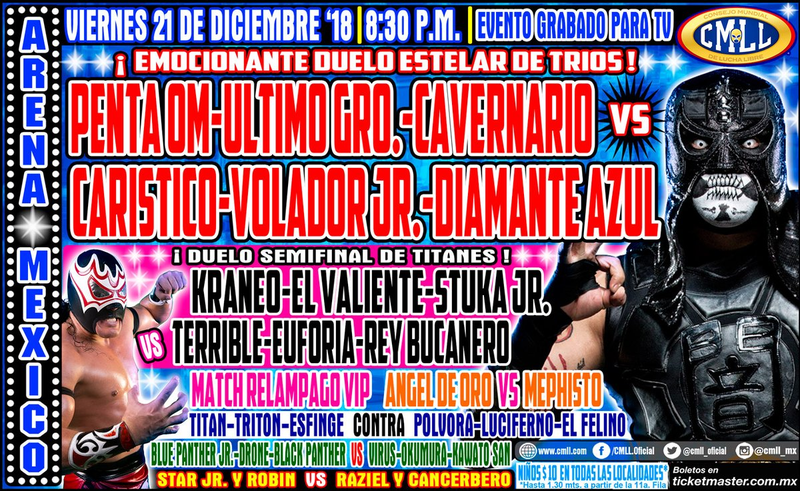 Grako replaced Principe Odin Jr. Tencicos took 1/3. 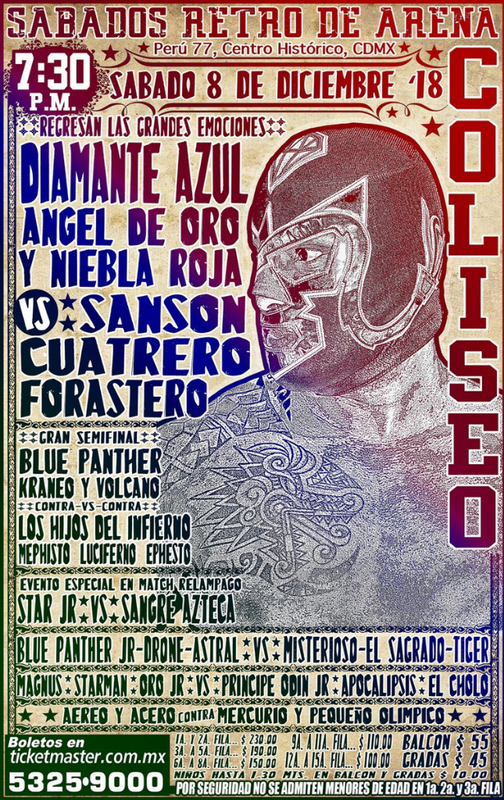 Diamante Azul replaced Caristico on Tuesday. Tecnicos took 2/3. 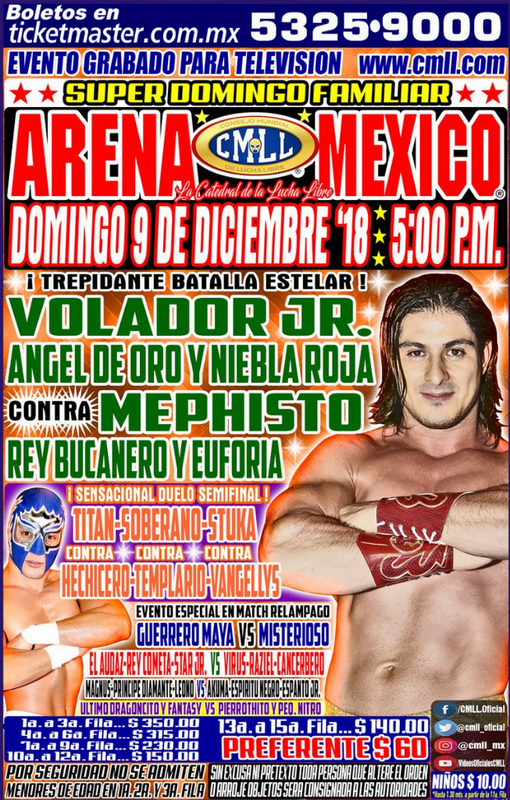 Pierrothito's first match after a couple months (US). Tecnicos took 2/3. Robin replaced Magnus, who missed both shows this weekend. Rudos took 1/3. tecnicos took 2/3, the last when Rey Bucanero fouled Niebla Roja. Originally a Jarochita/Sugehit/Sanely vs Comandnate/Metalica/Isis match. Team Camorra took 2/3. Akuma pinned Signo with help from Camorra. Post match promos teased Camorra/Akuma vs Signo/Yago. 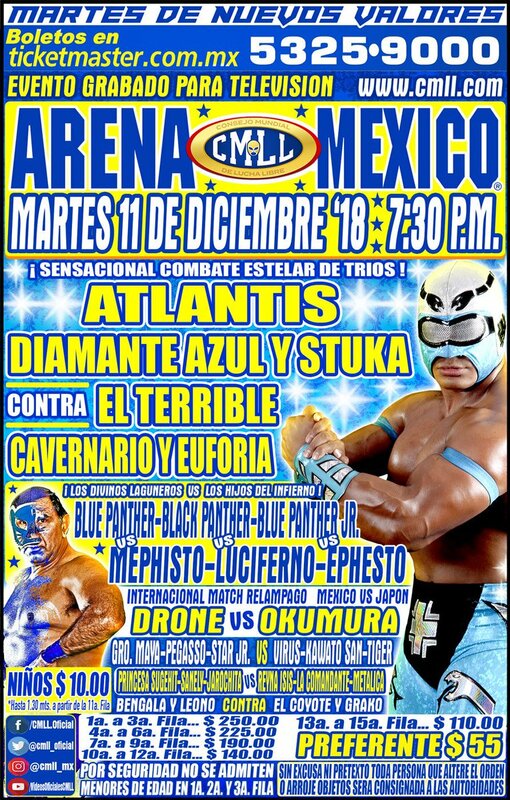 straight falls, the last by DQ when Tiger unmasked Maya. 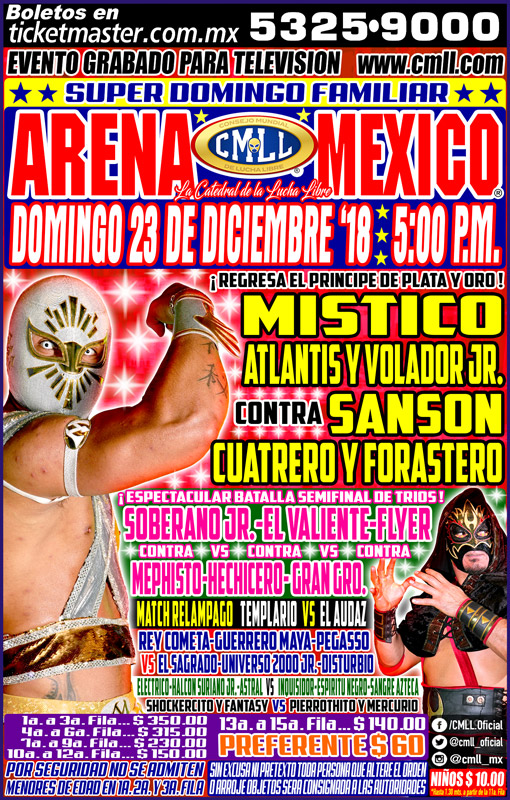 Rey Bucanero replaced Ephesto. Rudos took 2/3. 14:02. 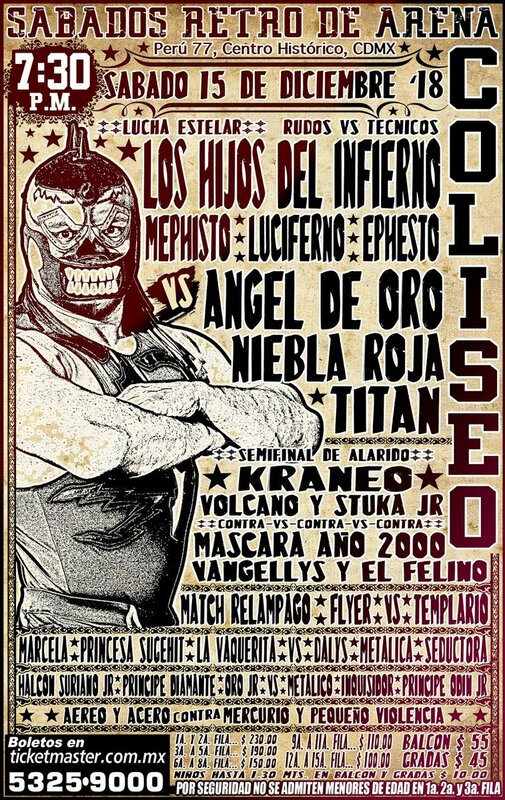 Tecnicos took 1/3, though Titan was hurt when Triton hit the ropes as he was sprigboarding for a moonsault. Titan seemed shaken up but not seriously hurt. 10:06. Tecnicos took straight falls, the last when Bucanero tried to fake a foul from Niebla Roja and was caught. 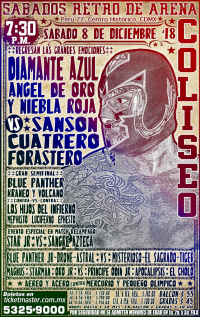 Diamante Azul replaced Flyer earlier in the week. Rudas took 2/3. Metalica used the ropes to pin Sugehit. Templario beat Flyer by the same Destoryer Flyer seems to lose to every singles match. 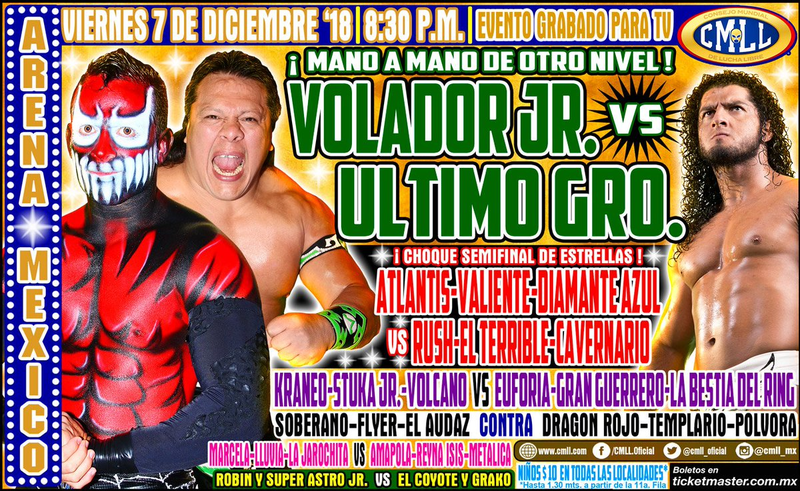 2) Hijo del Signo, Nitro, Sangre Azteca b Arkalis, Drone, Súper Astro Jr.
Arkalis replaced Starman, who appears to be in the Raziel zone of being listed despite actually being out injured. Rudos took 2/3. 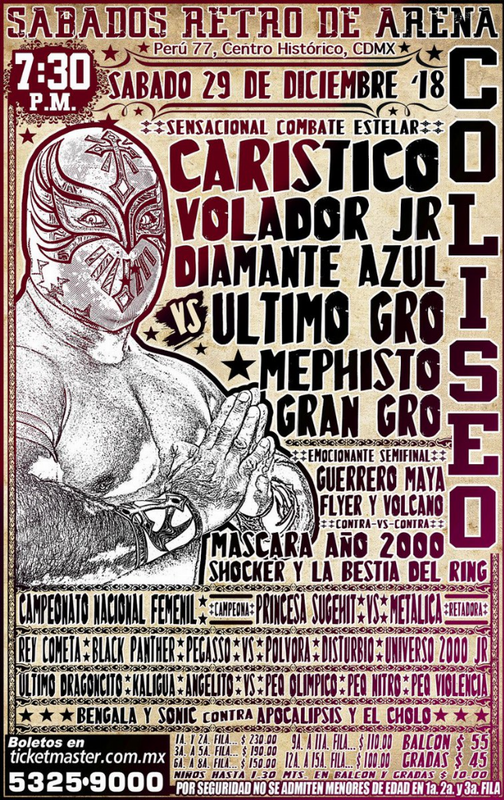 4) Audaz, Guerrero Maya Jr., Rey Cometa b Sagrado, Tiger, Universo 2000 Jr.
straight falls. 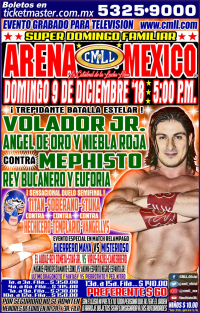 Mephisto unmasked Valiente in the second. straight falls, both DQs. Yago unmasked Akuma. The mask/hair vs mask/hair match was set for 01/01. 6:57. 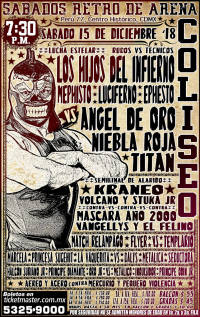 Angel de Oro surprised Mephisto with a small pckage. 5:24. Camorra ran in to attack Signo, Yago ran in to attack him, and Camorra unmasked Yago. Promos to talk about next week's apuesta match. Caristico tossed his mask to Penta. 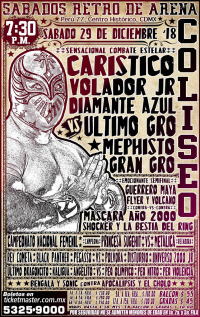 Surprise title switch, with Metalica taking falls 2/3 to become the 20th modern champion. Princesa Sugehit falls on her 6th defense. 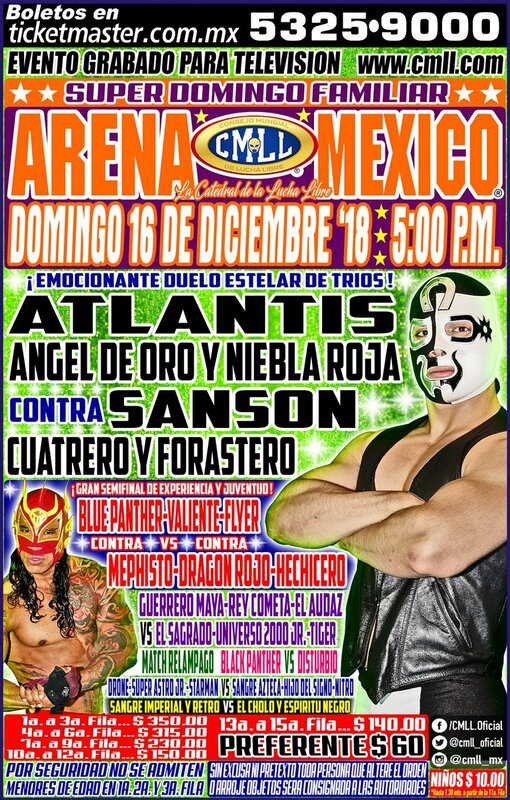 Metalica wins the title in her first ever title shot. 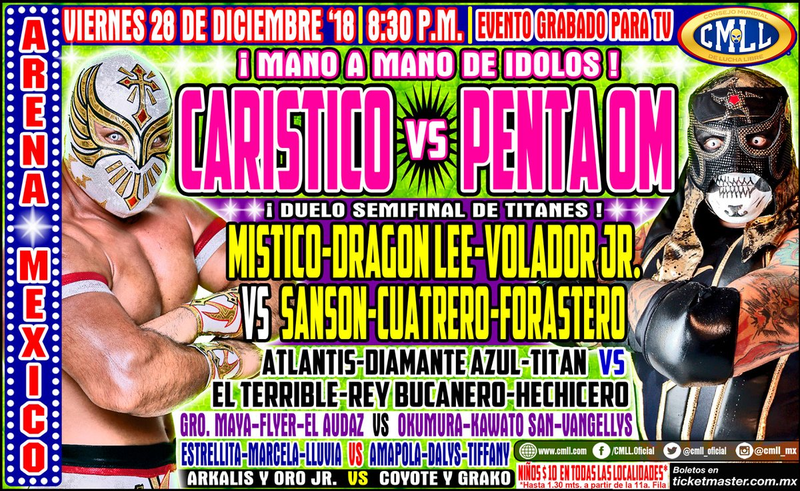 Carstico replaced Dragon Lee mid-week. 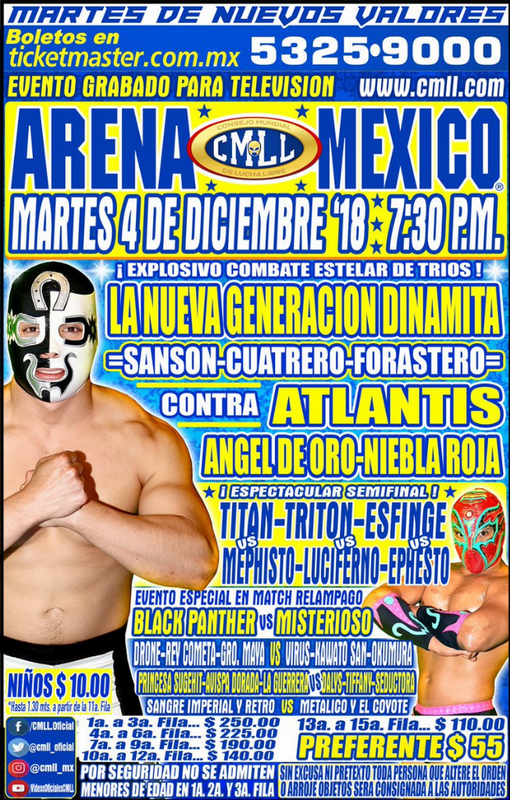 Titan replaced Diamante Azul. Tecnicos took 2/3, the last by DQ when UG fouled Caristico. Money thrown in. 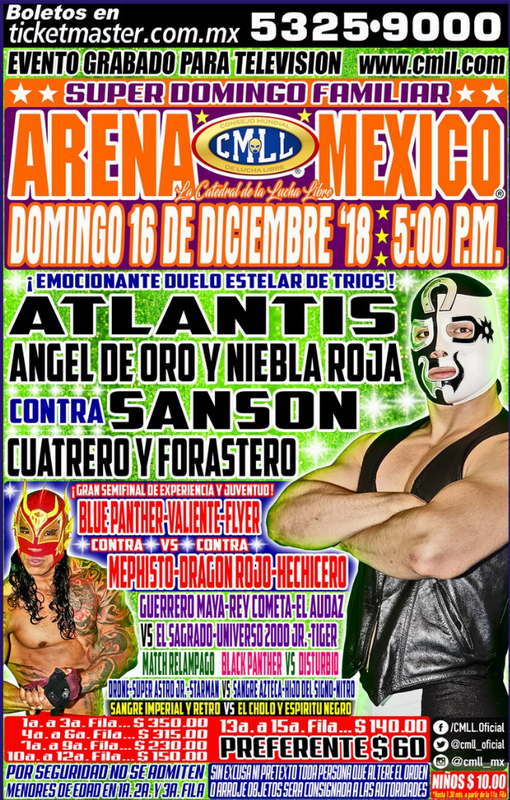 1) Leono & Robin b Inquisidor & Príncipe Odín Jr.
Nitro replaced Sagrado. Rudo stook 2/3. 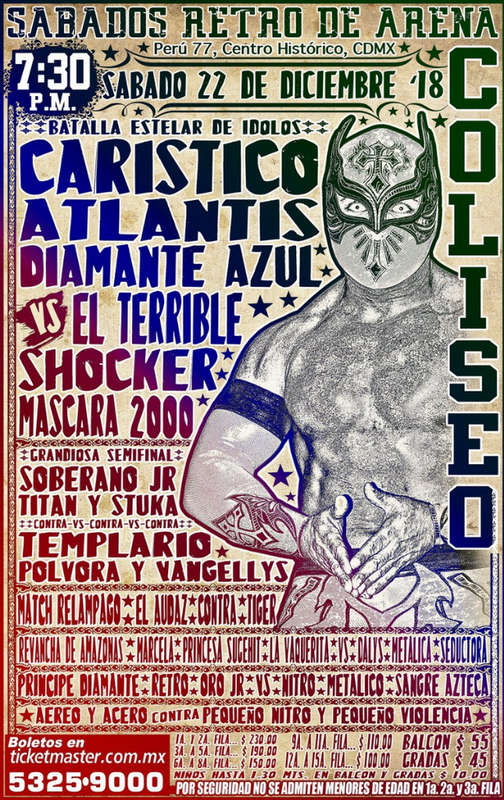 Rudos took 1/3, Shocker replaced Diamante Azul but didn't really want to be a tecnico and betrayed his team. 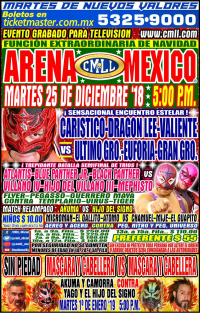 Caristico replaced Dragon Lee on Wednesday. Tecnicos took 2/3. 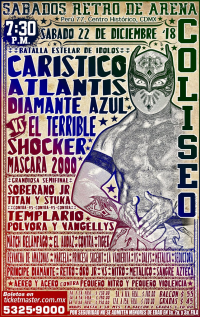 UG unmasked Caristico to end the main event in a DQ for two straight nights.